I have a JIRA License: What changes in JIRA 7 affect me? After switching to JIRA 7, your JIRA license becomes a JIRA Core license. Nothing changes in terms of price compared with your previous license. (You can find exact prices here.) In terms of functionality, you will recognize a focus on task management, project management and process management with JIRA Core. These are the important things for business teams. Development-specific terms and functions are no longer included in JIRA Core so non-developers have a clearer view of things like HR tasks and marketing processes. I have a JIRA and JIRA Agile license: How do I license in the future? If you purchased JIRA and JIRA Agile or still currently use a version older than JIRA 7, nothing changes for now in terms of support. JIRA and JIRA Agile are combined for JIRA Software, and there are no changes in pricing since Atlassian is grandfathering them for an indefinite period. This means you can still renew support at the usual cost. It is different for upgrades. JIRA Agile had a fixed price starting at 100+ users before the introduction of JIRA Software. This will no longer be the case in the future. If you upgrade with less than 500 users, nothing changes in terms of cost. But if you have more than 500 users, you will notice a cost increase for the upgrade. We currently have both developers and non-developers using JIRA and JIRA Agile: How will these be licensed in the future? JIRA 7 turns JIRA Core, JIRA Software and JIRA Service Desk into three stand-alone products that you can combine in once instance if desired. In the past, JIRA Agile had to be licensed for all JIRA users. This is no longer the case. You have 100 developers but only 25 non-developers? Then you no longer need 250 JIRA and JIRA Agile users, you need only a 100-user license for JIRA Software and a 25-user license for JIRA Core. This means reduced costs for you. How are users counted if all three products are used? This question is easy to answer. 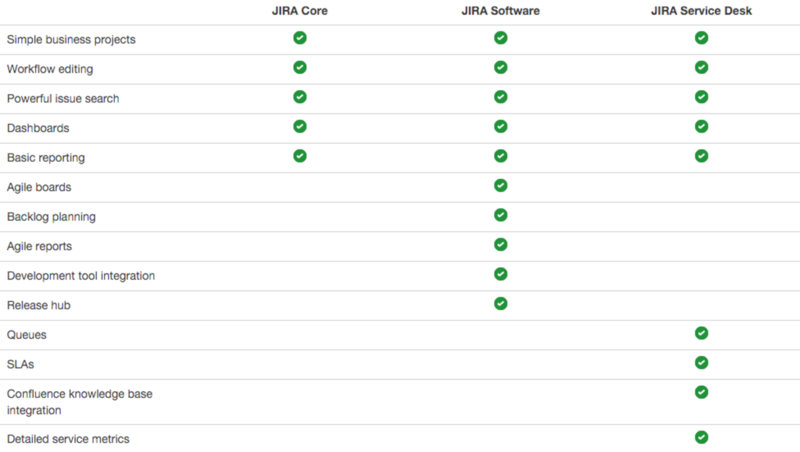 JIRA Core includes the pure JIRA Core license. JIRA Software and JIRA Service Desk include access to JIRA Core but also to Software and Service Desk functionalities. A JIRA software and JIRA Service Desk user always has a JIRA Core license as well. How does the actual license switch take place? Let’s say you have a JIRA license and support until 04/01/2016. After updating to JIRA 7, your license automatically becomes a JIRA Software license. That means you can also use agile development features free of charge until 04/01/2016. If you wish to renew your license support starting on 04/01/2016, you will receive a quote from Atlassian to renew your JIRA license. But you can also renew this license as a JIRA Core license. Please contact us via e-mail lizenzen@seibert-media.net if you have questions. You have a JIRA and JIRA Agile license and switch. In this case, your JIRA license is automatically converted to a JIRA Software license. This can be renewed as a normal JIRA Software license once support expires. Please note that you can receive a refund for any unused JIRA Agile license period. If you switch to JIRA 7 and still have remaining support for JIRA Agile, please contact us. You still have a JIRA Service Desk license with a JIRA-linked user count instead of the currently valid agent model? After switching to JIRA 7, your license is converted from a 100-user license to a 100-agent license, and you can also obtain the first support renewal at the cost of the old 100-user license. After this renewal, you should check whether you need 100 agents and then use and renew this model. With JIRA 7, support renewal and upgrades are not provided in the user-based model. But then I pay double for a JIRA Service Desk agent if he is both a developer and business team member, right? The simple answer is yes. If you have 100 JIRA Core users, 250 JIRA Software users and 50 JIRA Service Desk agents, there are effectively 400 JIRA Core users. This means you may end up with too many licenses for JIRA Core. But in the long-term, the separation of teams will likely be a positive thing for you. And what about add-ons? Do these have to be individually licensed for each product? Scenario 1: JIRA Core: 25 users, JIRA Software: 500 users -> Plug-in must be licensed for 500 users. Scenario 2: JIRA Core: 250 users, JIRA Software: 25 users -> Plug-in must be licensed for 250 users. Scenario 3: JIRA Core: 50 users, JIRA Software: 100 users, JIRA Service Desk: 15 users -> Plug-in must be licensed for 100 users. This setup has mostly positive aspects as long as you have 100 users each for JIRA Core and JIRA Software. You then have 200 users with JIRA Core access and only have to pay for 100 users. In some cases, it can also be detrimental if you have one 25-user license for JIRA Software and one 500-user license for JIRA Core. If you then need a special plug-in for developers, you still have to license it for 500 users. However, Atlassian is working on a long-term solution allowing each product group to be licensed individually. When do I need JIRA Software and when is JIRA Core enough? We don’t use agile methods, but Boards would still be nice for our teams. Is this no longer possible with JIRA Core? If you decide to use JIRA Core only, it also removes the option to use agile Boards with developer functionalities. At the Summit 2015, Atlassian announced it would offer task boards in the near future. An exact date still hasn’t been set. If you want to work with Boards in JIRA Core, consider the plug-in Comala Canvas for JIRA. The plug-in is fee-based, but you’ll still pay less for JIRA Core and Comala Canvas than JIRA Software. You can evaluate the plug-in via the Atlassian Marketplace and purchase it from us (of course with the usual benefits of purchasing a license via //SEIBERT/MEDIA). If I use JIRA Core, JIRA Software or JIRA Service Desk, what can each user view? As described above already, each user of JIRA Software and JIRA Service Desk also has a JIRA Core license. Provided that each of your users has the permissions to view all tickets from other spaces, a pure user of JIRA Core can also view JIRA Software and Service Desk tickets. However, specific features remain hidden such as Service Level Agreements (that a Service Desk agent can see) or Scrum Boards (that a JIRA Software user can see). However, comments are still possible so a manager can contribute to a Service Desk case, for example. Do you have questions about the new JIRA product and license structures or their implications? Then contact our Atlassian licensing experts for assistance. Call us at +49 611 205 70 42, write us at lizenzen@seibert-media.net or submit our contact form. //SEIBERT/MEDIA is an official sales partner of Atlassian and one of the largest Atlassian experts partner worldwide. We can assist you with all aspects concerning the introduction and operation of your Atlassian products – from licensing to productive use.